Join us for a workshop with the most experienced Ki Society instructor in the US. 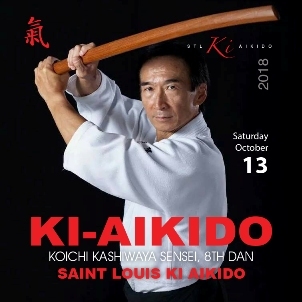 Midland Ki Federation Chief Instructor Koichi Kashiwaya has the ability to teach major concepts as well as the finest detail that comes from nearly 50 years of dedicated practice. Open to all students. There will be a short break in each class. Registration SIGN UP AT THE DOJO. You may also register by by phone or e-mail.